What Is The U.S. Merchant Marine? All U.S. seamen (citizens and green card holders) are certified, documented and licensed by the U.S. Coast Guard. Anyone holding such a certification or license is a de facto member of the U.S. Merchant Marine. There is no fancy uniform and it doesn't come with a rifle or sword (unfortunately). These are the professionals that man our commercial fleet of vessels. Everything from the massive ocean going tankers and container ships, longer than the highest skyscraper is tall, to the ferryboats carrying hundreds of thousands of people to work every day. From the tugs pushing barges full of grain, ore, and petroleum products to the fishing fleets harvesting the bounty of the sea, and research vessels trying to unlock the mysteries that lie beneath the ocean waves, which by the way cover 70 percent of our planet. It's easy to see that the options are numerous for someone choosing a seagoing career. If you want to stay close to home there are jobs available on vessels on our inland waterways as well as in our harbors. If you like to travel the merchant service is an ideal way to see the world. We as a nation and the world as a whole rely extensively on the maritime industry to move raw materials as well as consumer products, and every one of those vessels have merchant marine professionals guiding them to their ports of call. You will also find them standing on the bridge and manning the engine rooms of passenger vessels and harbor tugs. There is a large population of civilian mariners operating the growing number of support ships for our military. The choices are virtually endless. What Exactly Is The Commercial Marine Industry? Simply put, any vessel that floats and generates an income is a commercial vessel. The only vessels that would not be considered commercial are private yachts that never charter and the boat you and your buddies go fishing on, provided no one paid to go fishing with you. Even vessels that do not try to make a profit will be considered commercial if they have an income (such as a non-profit sail training ship). Commercial shipping is more than the captain and some sailors on deck. There are engineering and steward departments just as on yachts, only far more involved. Where a mega-yacht may carry an engineer or even two, a larger commercial ship can carry an entire engineering department. The engine room watch staff can have wipers, oilers, watchkeepers, and engineers all on duty at once. Depending on the size of the ship there can be specialized crew positions such as electrician, or refrigeration specialist. The stewards department will have everyone from cooks on a cargo boat to chefs and bartenders on a cruise ship. From a pantryman and galleyhands to cabin and dining room stewards all the jobs available in a five star hotel or a truck stop diner are available in the commercial maritime industry. Ships officers share the responsibility for the safety of their ship, her crew and her cargo. As a deck officer you will be in charge of supervising the safe navigation of the vessel at sea as well as the discharge of cargo while in port. You will be called upon to quickly develop your management skills while supervising the ratings that comprise your crew. As an engineering officer you will be involved in the operation of the ships main propulsion machinery and physical plant. Within 10 years of starting your career you could be eligible to qualify as Captain or Chief engineer with the operation and management of the entire vessel and her crew your responsibility. Why Would I Want To Go To Sea? The reasons are many, but they need to be yours. The life of a seaman can be filled with excitement and boredom, glamour and drudgery all in the same day. It can be very financially rewarding or you can struggle to get by, just as in any other walk of life. Perhaps the romantic view of the life of a sailor is what you seek or the adventure of travel. Whatever reason is yours, it can lead you to a vast and energetic industry that is well worth the pursuit. If you have an urge to travel there may not be a better way to see the world. The ships that carry the worlds goods travel to the most exotic of locations offering the seafarer a true glimpse of the many cultures and customs that make up this planet. While delighting in our differences you will also get the chance to marvel at the true brotherhood of mankind, making friends and contacts that will truly last a lifetime. Friendships that you will make with your shipmates are in some ways stronger than the bonds of family. In many respects you are joining a fraternity of highly skilled professionals that share a special relationship. You not only work with these people you live with them and depend on them. You are a team that must work together for your own safety and the safety of the ship. The pay is good, but perhaps more important is the opportunity to enjoy it. Many employers offer about three weeks paid vacation for every month on board. Some companies offer day for day paid vacation for their officers, meaning they get one month paid vacation for every month they work. Of course wage scales vary but the average pay for an able seaman rating is about 40K - 45K per year, while a junior officer may receive between 60K - 75K. Senior officers like a chief mate or first assistant engineer can expect a yearly pay of about 80K - 125K and a Captain or Chief Engineer from 100K to 180K. Do I Have To Go To A Maritime Academy? No. Any rank can be attained in the maritime industry simply by starting at the bottom. People who start out as an ordinary seaman and chose to stay in the deck department to pursue command are said to have "climbed through the hawsepipe". The hawsepipe is the hole through which the anchor chain passes through the hull of a ship. Luckily it is just an expression and no one has to try and fit through the hawsepipe. Command of all departments on a commercial vessel can be achieved by someone coming from an entry level position with no college education. This does not mean that no schooling is involved. The amount of education and training required to be a professional mariner increases in parallel with the national and international standards being raised on a steady basis. But these are industry specific courses such as first aid, fire fighting, ship's stability, sea survival, etc. Where In The World Would I Be Working? Everywhere and anywhere. This could be the most diverse area of the industry. Depending on what type of ship you went to work on, your travel could be extensive or limited, your schedule set in stone or changing every hour. 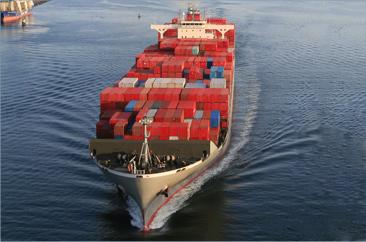 A cargo ship may regularly cross the oceans or a ferry boat may regularly cross the harbor. A cruise ship may run the same itinerary week after week or a sail training ship may embark on around the world cruise. Dive boats may search out good weather to match the best dives and fishing boats will follow the fish. You can be home every night or not see home for a year or more. The possibilities and opportunities are endless. The US marine transportation system encompasses a national and global network of navigable ocean, lake, river, and inland waterway routes. The system includes over 3,500 bulk oil transfer facilities, 10,000 marinas, a network of locks and dams, over 97,000 aids to navigation, commercial vessels making over 70,000 port calls annually, 110,000 fishing vessels and 20 million recreational vessels. As the worlds largest trading nation, the U.S. exports and imports about one-fourth of all global merchandise trade ($1.9 trillion in 2001). The largest parts of this merchandise trade - over one billion tons of cargo - are moved by water. Another billion tons of cargo is carried in domestic waterborne movements, which serve over 90 percent of the U.S. population. By the year 2020, US foreign trade in goods is expected to grow by more than half of its current tonnage, and inland waterways traffic is expected to increase as well. As ships and transportation systems become more complex, training requirements will increase, and crews are currently required to be trained and qualified to operate in accordance with international standards (STCW). Marine Transportation is an integral component of the US transportation system and is essential to our nations economy. The entire US transportation infrastructure, including ports and waterways and maritime training schools, are expected to be able to handle and provide this projected increase. As of 31 December 2004, there were over 250,000 mariners with Merchant Mariner Documents, Merchant Marine Officers License or both, issued by the United States Coast Guard. If you don''t fit into the water cooler crowd and your idea of success goes beyond the corner office to a life of travel and adventure. If you are looking for a career that offers you challenges and responsibility and rewards you for being innovative and self directed perhaps a career on a commercial merchant vessel is for you.